Hunt Club Creek is not shown on early maps. The first appearance I have found is in 1955 (Geological Survey of Canada 31G/5 edition 6, below right) as an intermittent stream following its 1950's route from Hunt Club Road. 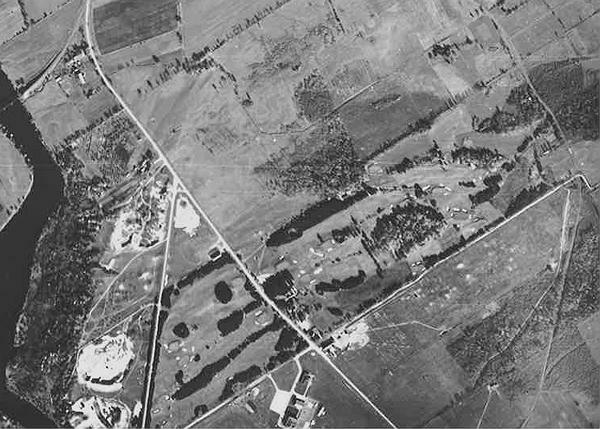 Before 1950 it was a seasonal rivulet draining a wetland located where the north-east corner of the Ottawa Hunt & Golf Club is today. Its original route down the bank of the Rideau River was modified about 1910 when the Canadian Northern Railway built its bridge over the Rideau River: it was then channelled along the west edge of the River Road (old Riverside Drive today) over to the edge of the rail embankment. My ground surveys, and the air photo of 1948 below, indicate that the original bed down the slope was about 60 m to the south of where it is today. At some point prior to the ed.6 map, an agricultural drainage ditch was dug along the eastern edge of the club lands; until 1950 it was connected to the branch of Sawmill Creek shown in ed.5. Roads, rail lines and the airport on both maps are shown as they were when the maps were issued in the early (ed.5) and late (ed.6) 1950's. Until about 1985, the Regional Municipality of Ottawa-Carleton called our waterway Uplands Creek. The ditch south of Hunt Club Road is internally called the DeNiverville Drain by the military, and some refer to the portion along the east edge of the golf course as the Dowler ditch (there were many Dowlers who farmed in the area). However, today all local government bodies agree on Hunt Club Creek, and as of late 2014 so does the Ontario Geographic Names Board, the official body for geographic names in Ontario. The creek began life as an urban stormwater sewer about 1950 when DND dug a ditch parallel to the railway to their resurrected WW2 Air Force base to join agricultural ditches north of Hunt Club Road. 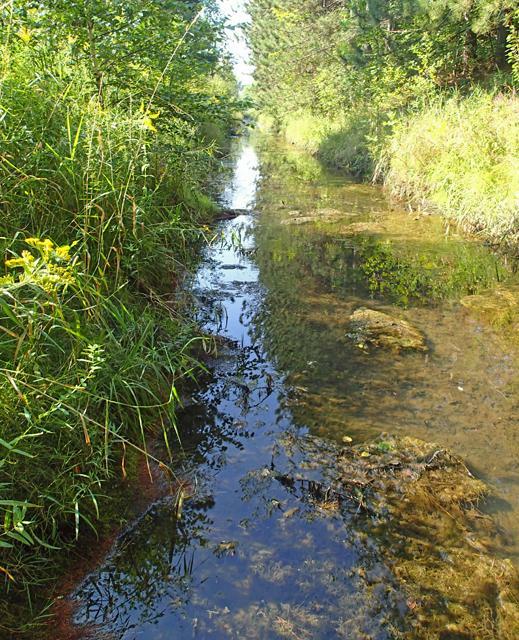 These ditches were then connected to Hunt Club Creek by cutting through the limestone ridge that formerly separated our creek's drainage basin from that of Sawmill Creek, leaving a portion of Sawmill Creek dry. Here is the earliest air photo I have found of the creek; the DND ditch, visible at bottom right, is under construction beside the railway; the limestone ridge has not yet been cut. An earlier agricultural ditch can be seen to the left of the new straight ditch; it connected to a branch of Sawmill Creek. A culvert for the Sawmill Creek branch is still present under the old Hunt Club Road, now Hunt Club Place, although it's now dry. DND probably chose to not use the old stream bed north of Hunt Club Road because part of it it was owned by the Ottawa Hunt and Golf Club; I've been unable to find any indication of why they decided to connect the Dowler Ditch to the Hunt Club Creek rather than retaining the existing drainage route to Sawmill Creek. The pre-settlement path of the creek down the steep slope to the Rideau River is clearly visible. The increased flow from the air base triggered further agricultural ditching over the years to prevent flooding. By 1967, the creek channel had been moved to the east side of the River Road; this channel was extended in the late 1990's as shown on the maps below when Riverside Drive was realigned. 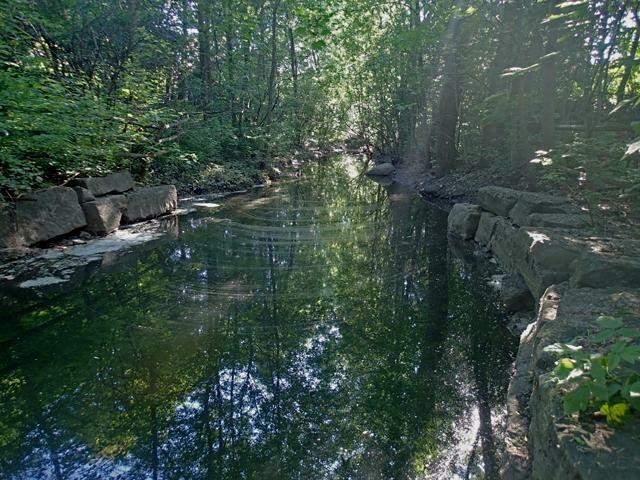 Conversion of the creek to the open stormwater sewer we see now was completed in the early 1980's by the Regional Municipality of Ottawa-Carleton when Campeau and Urbandale developed Hunt Club Woods. 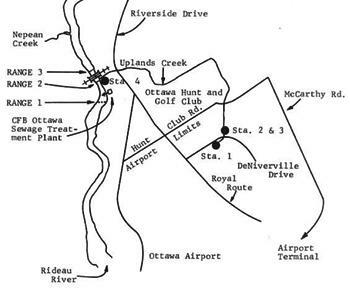 A 1975 Environment Canada report indicates that stormwater from the airport proper drained down what was then called Hunt Club Gully to the Rideau, and base stormwater was released to a collection area south of DeNiverville (Sta. 1 at right) where it was chlorinated starting in 1969. Sewage from the base (to the east of Royal Route) and airport (to the west) was handled by a plant located at the edge of the Rideau below today's Rivergate condos. Today, all sewage is handled by the City of Ottawa system ending at Green's Creek. Chlorination of base stormwater ceased prior to 1991. Originally, the length of the creek was about 1.6 km. Today, it's 3.2 km (excluding storm sewers), of which a quarter, 0.76 km, is in culverts. Its current drainage area is about 330 ha, of which 64 ha is fast runoff drainage from City of Ottawa storm sewers and 60 ha fast runoff from air base sewers. Its source is now within the air base, it now empties into the Rideau River at 45°20'N 75°42'W. Reflecting its limestone route, it's alkaline throughout, averaging pH 7.8. Due to the length in underground culverts and the heavy shading of much of the creek, its water is cold during the summer; the culverts return the favour in winter when underground warmth keeps the creek running under surface ice. Its dissolved oxygen levels are too low for most fish; the only species found is Culaea inconstans (brook stickleback), which may be an annual species surviving over the winter via eggs. The creek's elevation profile today is not that of a mature watercourse, it's less than 2 m/km for the first half kilometer, and increases gradually to 10 m/km until its final descent to the Rideau River, where it drops 15 m in just 140 m.
Summer 2013 the Rideau Valley Conservation Authority Streamwatch program conducted its first ever evaluation of its health, and I took part. September 2013 the Hunt Club Community Organization adopted the creek under this program; I'm the official Streamwatcher. 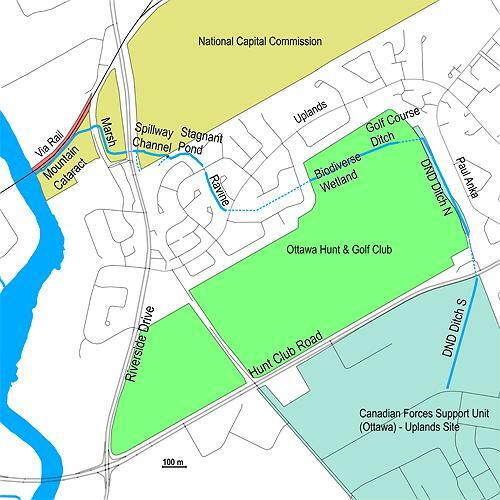 creek ownership; the City of Ottawa owns the parts of the creek surrounded by white. 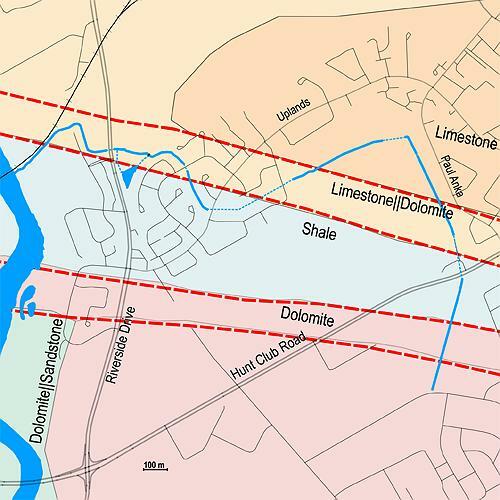 The white area between Mountain Cataract and Marsh is Old Riverside Drive, which has existed since 1827.
creek drainage area: light blue is ground water (slow), dark blue is storm water (fast), green lines are Ottawa storm water sewers. The creek now originates from a storm-water culvert just north of DeNiverville on the former Canadian Forces Base Ottawa South. As noted above, this ditch was dug in the early 1950's to improve the drainage of the housing part of the base originally built early in WW2. There are 700 housing units on the base, most of which are still occupied. 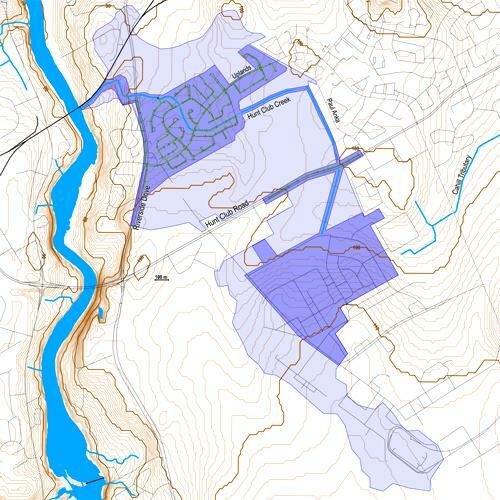 A very rough estimate of the pollutant load on the creek from the 27 ha of housing and 40 ha of little-used industrial buildings, based on EPA data on similar areas, indicates that the annual pollutant load on the creek from the base is in the region of 1200 kg/yr dissolved materials such as road salts, gasoline, oils, cleaning agents and fertilizers, and 10000 kg/yr suspended materials such as heavy metals abraded from vehicles, road grit and deposited atmospheric particles. 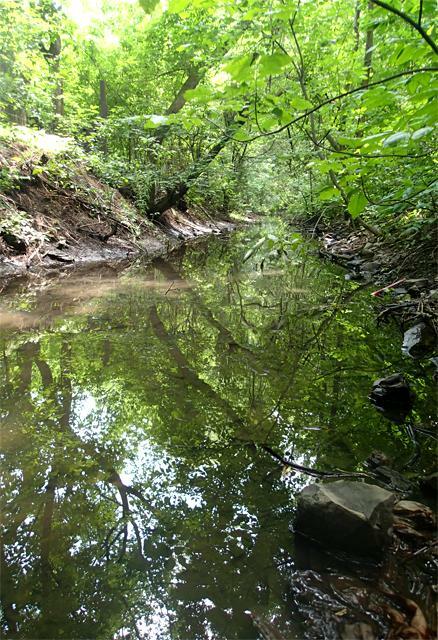 The creek here runs through woods its entire length; the bank slopes are cleared of trees often enough that the creek gets sufficient light to remain mostly clear despite its pollution load. It's bounded by 4' farm fencing both sides, paralleled on the east side by a dirt access road from the base and on the west by a well-used dirt bike trail. A gate used to bar access from the south, but has now been removed. The creek next passes through a 196 m culvert under Hunt Club Road (City of Ottawa ownership); storm water from 700 m of the road drains here. The culvert was built before a concession boundary kink in Hunt Club Road was straightened, so bypasses both the kinked and unkinked roadbeds (see the edition 7 map above). After 25 m (ownership uncertain) it passes under a chain link fence to reenter DND ownership where it's abandoned and overgrown. Throughout this section, the creek is separated from single family homes by a 4' farm fence on the east side and from the Ottawa Hunt and Golf Club by a path (liberally supplied with fallen crabapples and golf balls) where the Uplands railway used to be and a 7' barbed wire topped fence on the west. The stream bed is sand for the first bit, but rapidly turns to anoxic sediments 30 cm deep throughout the rest of its length. The east fence was added after the ice storm of 1998, when homeowners' efforts to clean up the damage resulted in liability concerns by DND. DND has recently scheduled this land for divestment. 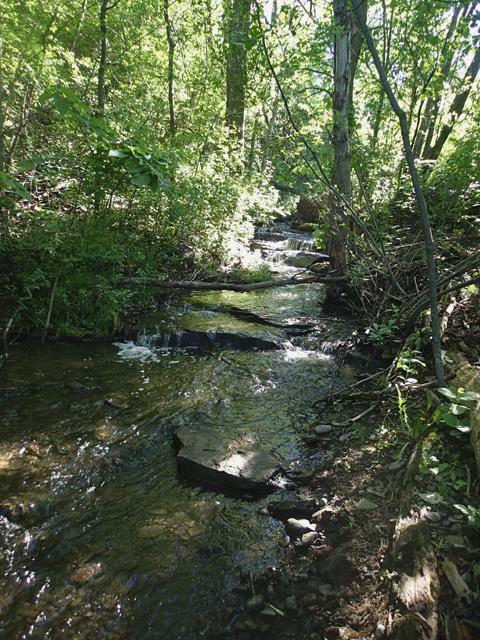 Hopefully it will go to the City of Ottawa and homeowners will once again be able to access and look after the creek with support from the city. Since the old railway bed was built above the 100-year flood level of the creek, it would be possible to turn it into a public access path as many area residents wish. The creek now enters ownership of the Ottawa Hunt and Golf Club. Originally there was a 26 m culvert under the railway here; about 1996 it was extended to the current 82 m to improve a golf green. It continues in a ditch which remains essentially as it was excavated by DND in 1950. The limestone ridge here originally separated the drainage of our creek from that of Sawmill Creek. It's now heavily shaded by thin unhealthy cedar trees: limestone bedrock isn't suited to cedars. 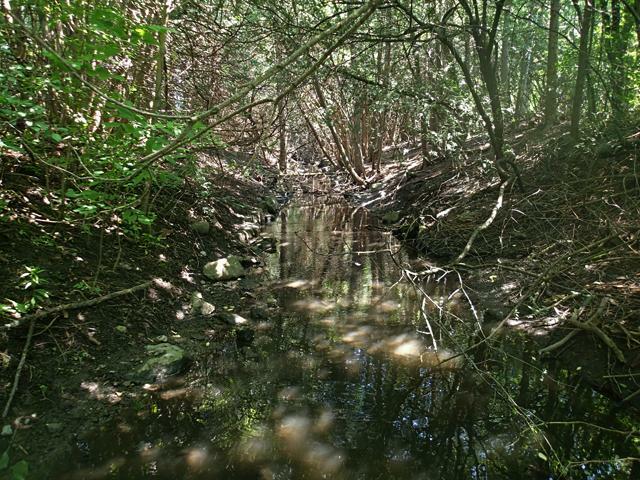 With inadequate sunlight to support vegetation, the bottom of the stream is plugged with deep anoxic sediments that spew black muck into the water when disturbed. Essentially nothing riparian can live here. 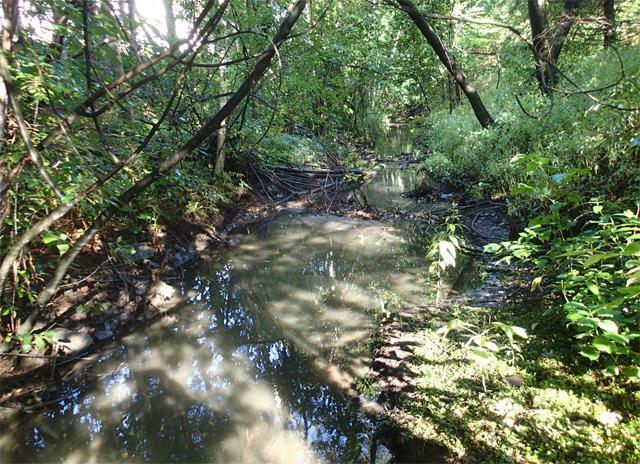 This section of the creek, a marshy area before settlement and originally the source of the creek, is maintained by the golf course to standards necessary to obtain Audubon certification for the course. 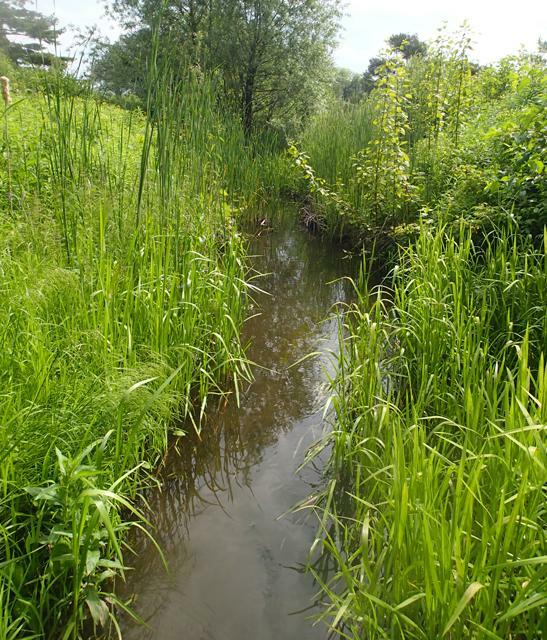 It's superbly done, with a wide variety of healthy riparian plants throughout the length. By its end, the water is close to clear and healthy. It would be wonderful if the rest of the creek was so well looked after. EPA data indicates that the pollutant load from the 40 ha of the golf course that drains into the creek here is very small compared to urban housing, about 80 kg/yr dissolved N&P and 120 kg/yr suspended material. 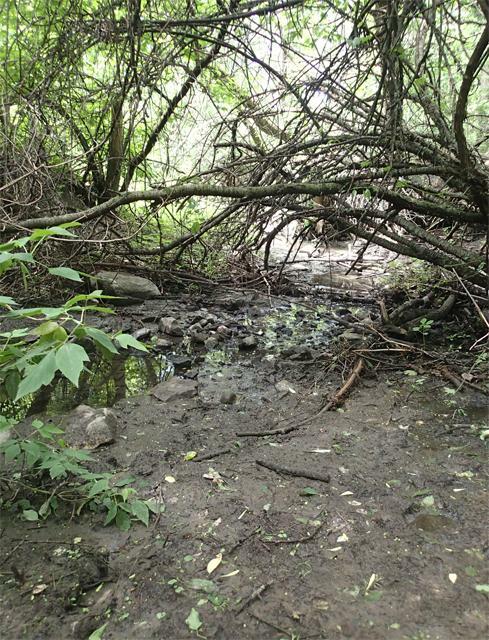 Back under ownership of the City of Ottawa, this 1980's burial of the stream bed from the golf club to north of Uplands Drive was typical of the dismissive treatment of streams in urban areas at the time. Most of the flow comes from the easterly exit (the left one here), which is connected to the golf course section of the stream. 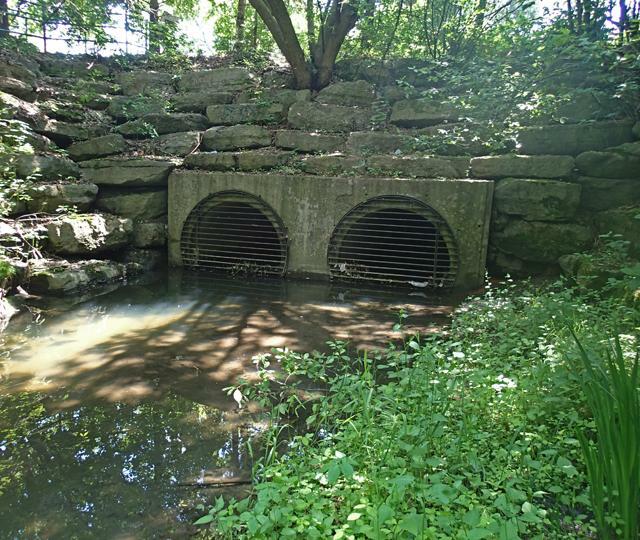 The westerly culvert runs from Country Club Drive, where it receives some storm water, under Uplands Drive where it receives more storm water. In this area, house weeping tiles are connected to storm sewers, and the eavestroughs collecting rainfall from the front half of houses almost all drain to an asphalt driveway that conducts the water directly to street storm drains. Roof drainage from the rear of houses generally discharges to the ground, but much of this is also drained into storm sewers via foundation weeping tile. EPA data on residential areas similar to ours indicates that the annual pollutant load on the creek here from 64 ha of Hunt Club streets and residences is about 600 kg/yr dissolved material and 7000 kg/yr suspended material. 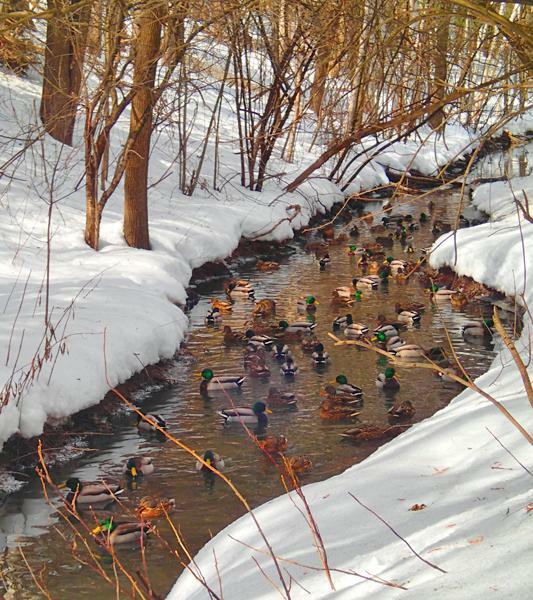 The advantage of the long culvert: even at -20C the water is open below it for winter birds and animals, a feature welcomed by residents of Archer Square whose houses back onto this section of the creek. This section's V shape with slopes at the angle of repose, and the absence of meanders, shows its youth. Peak water flow of the creek was roughly doubled when DND drainage was added about 1950 and close-to-doubled yet again with development in the 1980's. It may well have survived burial because its depth and width made it cost too much to fill in. Most of the trees along the steep banks were planted in 1981 and are now unhealthy, shedding branches down the slope that are left to rot in the water. Some branches in the stream provide habitat for fish and amphibians, but too much just traps waste and fouls the water. As the golf course has shown, this could be a restorative and attractive lightly-wooded riparian section if the city were willing to provide some resources to restore it, removing overaged trees to increase light to that sufficient for riparian vegetation to grow, and planting the stream bed as the golf course has. The creek next passes through a 37 m culvert under Gillespie Crescent, where more storm water is dumped, to be backed up behind a control dam. The water surface here is usually stagnant, coated with slime and oils, and often has a heavy odour that is not appreciated by those who live next to it, especially during dry weather. The surface used to be cleaner when the dam that holds the water was made of squared timbers that skimmed off surface slime; puddle ducks raised young here then. That ceased when the dam was replaced by solid steel about 2010. 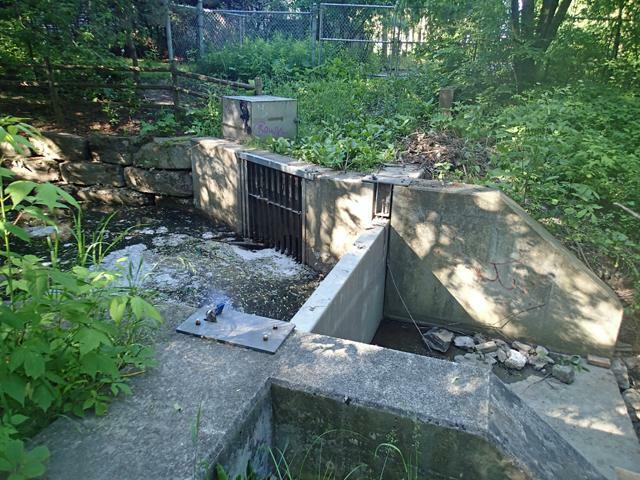 This dam blocks summer water flow to the next section of the creek except during large rainfalls. The stream is diverted through the 62 m culvert whose entrance is shown to a constructed stormwater depression, to reduce sediment reaching the Rideau River. Waste branches etc. cleared by city staff from the grate are just dumped nearby, providing an inviting target for passers-by to throw them back into the water. At left, 43 mm rain in 5 hours; the dam can't be made any higher or water would flood basements of homes to the west of the creek. During winter, the culvert is blocked off and the dam lifted, allowing water to flow along its old channel. Storm water enters this pond, built in 1984, directly at three points in addition to the flow from the creek. There is often a large amount of undesirable aquatic growth, especially during dry summers. Still, a significant amount of wildlife uses the pond: green backed & great blue herons, kingfisher, black & mallard ducks, redwing blackbirds, even an occasional osprey attracted to the goldfish and frogs. The city does some aquatic planting in response to pressure from the residents whose homes back onto the pond; cutting of sumac and Virginia creeper is mostly done by residents to prevent them from taking over the area. 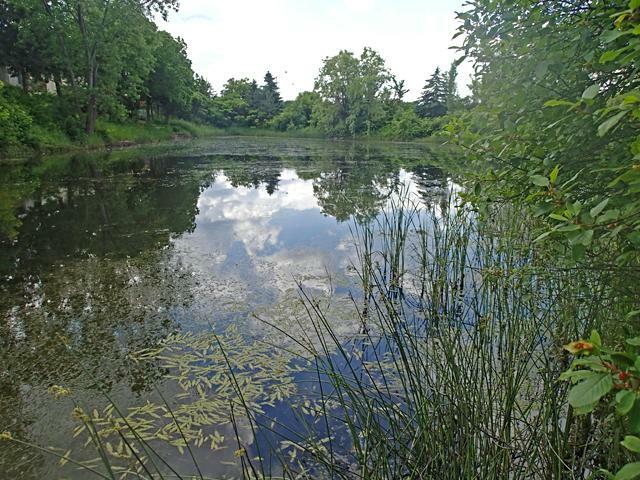 Residents adjoining the pond in general appreciate the pond, and usually clear an ice rink on it during the winter. The pond drains back into the creek through an 83 m culvert to just east of the culvert under Riverside Drive. The pond is a bit small for its purpose, but can't be made significantly larger without encroaching on NCC land to the north. Owned by the National Capital Commission, this part of the creek is the only section whose bed is essentially unaltered by human activity. However, in summer it's now left with only water seepage from the adjacent meadow, except during high rainfalls when the stream tops the dam. Its water flow used to be maintained by a small bypass of the dam to maintain ecological health, but the splitting of the creek flow during low flow times led to unacceptable smell from the exposed sediments next to homes upstream. The soil of the meadow is shallow glacial till overlaying layered dolomite and limestone, so seepage into the creek here is low; most goes west under Riverside Drive to the marsh there. 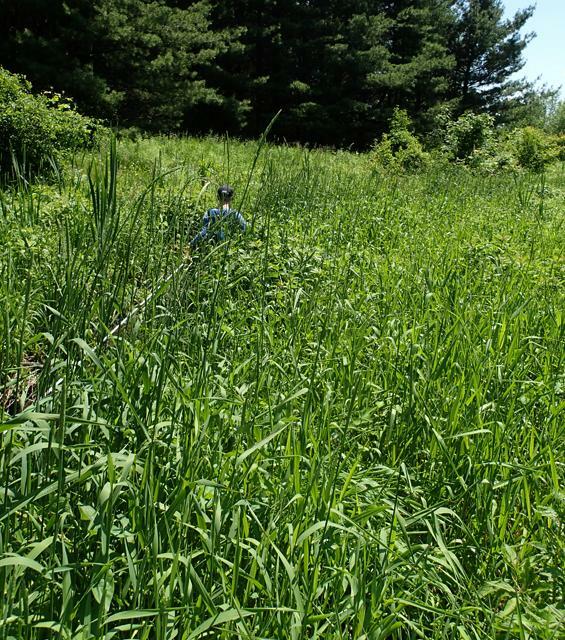 A low 34 m culvert under Riverside Drive (City of Ottawa) leads to a now-natural swath of NCC-owned grassy cattail marsh, most of which was formed in the late 1990's as part of realigning Riverside Drive. Today it provides a home for a dense growth of riparian plants that, although limited in biodiversity, comes close to restoring water purity by its end. It's not easy to access; a boardwalk observation area connected to Old Riverside Drive could greatly increase public appreciation of the creek and a venue for education on what we dump into it. In mid 2013 a beaver constructed a low dam and lodge in this section, but the NCC destroyed them, disposed of the beaver, and dredged the half of this area next to Riverside Drive. In future, I hope to persuade them to fit any dam in this area with a height-restricting siphon that will allow beavers to contribute to its riparian habitat without flooding damage to neighbours. Crossing the City right of way for the old Riverside Drive, marked by a small footbridge built by local residents and path, this section of the creek drops 15 m over the last 140 m of its length via a series of rapids and falls that aerate the water before its release into the Rideau River. A well used path along the bank of the Rideau provides access via a footbridge (also built by local residents) where it joins the Rideau. Crayfish and water striders are common throughout its length. Half way down the slope, the bedrock becomes mostly shale, although there are some dolomite boulders that have tumbled from the top layer. This section is difficult to appreciate due to a VIA rail fence that is installed erratically down the slope, apparently taking the easiest path for the installers rather than following the edge of the rail embankment as it should. 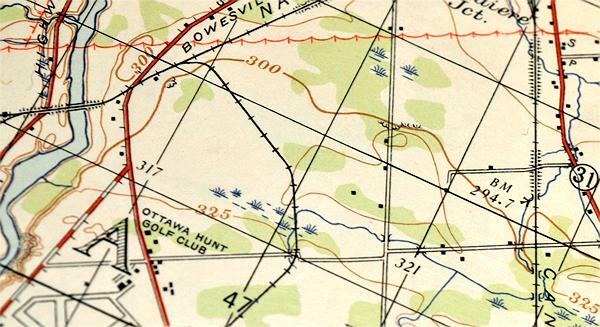 The University of Ottawa holds post-WW2 editions of Canada's local post-war topographic maps, earlier ones are only held in the National Library. Air photos are from the National Air Photo Library, geological and area maps from GeoGratis (being some 50 years out of date except for roads, they require major correction from satellite images and ground surveys). Chlorination history came from Environment Canada and Regional Health Department reports, pollution loading from an EPA Stormwater Guide (1996) chapter 4. 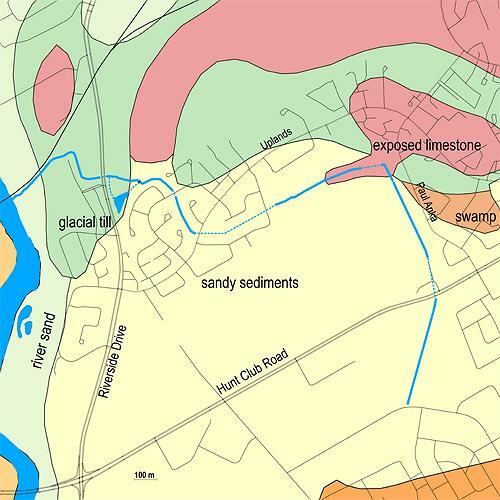 Sewer diagrams and land ownerships are from the City of Ottawa (2013), drainage south of Hunt Club Road from DND; the creek drainage area is based on their data combined with a terrain model derived from GeoGratis data and my ground surveys.